Our Superfood Spotlight series often focuses on foods most definitely not in the average pantry – from tonic herbs to exotic berries, there are a lot of new foods to learn about, right? 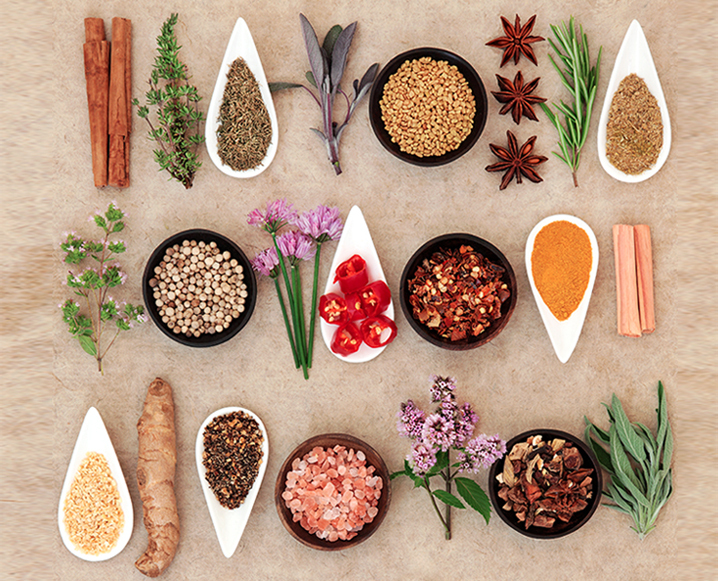 But what many of us don’t realize is what an arsenal of powerful superfoods already live in almost every one of our kitchens: the spice rack. This superfood has really wedged its way into the spotlight in the last couple of years. Known for its bright yellow color and prized for it’s anti-inflammatory properties, this potent spice may also help prevent Alzheimer’s disease and alleviate symptoms of arthritis. More and more studies are being conducted and evidence is mounting that curcumin, an antioxidant in turmeric providing many of it’s medicinal benefits, may help prevent cancer and oxidative damage. How to include it: Buy it fresh, powdered, or in supplement form. Add to savory and sweet dishes, juice it or spice up a delicious golden latte. From the same family as rosemary, this antioxidant-packed herb is also wonderful at reducing inflammation anywhere in the body. Further research indicates that sage may help improve memory and brain function. With a mild bitter astringent flavor and intoxicating aroma, you often find this herb in savory Fall dishes. How to include it: It’s best fresh, chopped and used as seasoning in savory dishes like meats -think Thanksgiving turkey and stuffing. Sage is also excellent as a pop of flavor in sweeter foods. Try infusing honey or oils with this aromatic herb. Cumin is an excellent addition to your spice rack. Known for its seemingly endless benefits, it’s long been used as a digestive aid and potent immunity booster. Additionally it may help manage diabetes by reducing chances of hypoglycemia and keeping blood sugar levels stable, as well as helping respiratory disorders such as asthma and bronchitis. It’s full of essential minerals such as phosphorus, thiamin and potassium. How to include it: With an earthy and nutty flavor associated with many chili seasonings, its best in savory dishes like roasted veggies. Make sure to source this herb whole and grind before use for maximum benefit. Cinnamon is a wonderful addition especially for those managing blood sugar levels, blood pressure and type 2 diabetes. It may actually help increase insulin sensitivity. In addition it contains iron, calcium and manganese and potent antioxidant activity linked to fighting inflammation and lowering cholesterol. How to include it: This sweet and spicy superfood is a great addition to baked goods, oatmeal, toast, cereal, yogurt and even smoothies. Try a pinch of it in savory foods like roasted veggies to enhance their natural flavor. Capsaicin, the active ingredient in cayenne has long been linked to increasing metabolism function and aiding in weight loss. Additionally it may help to reduce appetite and improve circulation. It may even prevent certain types of cancer. How to include it: With a potent heat, use sparingly in dishes or take in supplement form. You either love or hate the sharp taste of cilantro. Loaded with nutritional properties, it is probably most prized for its ability to clear the body of toxins, specifically heavy metals. In addition it can help reduce stress, improve sleep quality and of course is loaded with antioxidants. How to include it: Again, some love the flavor, while others swear it tastes of soap. If you are among the lucky to love it, throw it into every dish you can think to, including salads, soups, salsas, and even smoothies for a pop of flavor. This spice is known as a natural antidepressant and used for these mood-enhancing and PMS relieving properties. It is the most expensive spice in the world and takes up to 250,000 flowers to produce 1 pound. How to include it: Source it dried or in an extracted form. With a delicate flavor tasting slightly of honey, a little goes a very long way. You’ll find this spice often included in Middle Eastern and Indian cuisine, from savory to sweet dishes it can help to elevate the entire flavor. Share the post "Superfood Spice Rack: 7 Powerful Foods Already In Your Kitchen"